I started with a Small Glassine Bag from Annie's Boutique and filled it up with yummy pretzel treats. Next I attached a fun tag I made using some gorgeous paper and a great "hello" die cut. 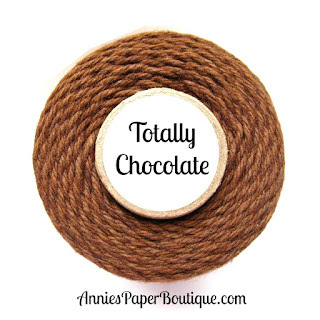 I simply covered the die cut in Totally Chocolate Trendy Twine. I love how it turned out. I stamped the tag with a Fall sentiment and used a teeny tiny gold clothes pin to attach the tag. 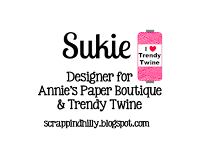 Trendy Twine - Candy Cane Sequins Mix!! It's Millie, from Crafting with Creative M, and for today I have a special post for you all! I am showcasing the very festive Candy Cane Sequins Mix along with the Candy Cane Trendy Twine. Yiippeee!! 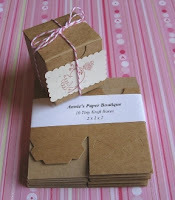 Here is what I created........Mitten Shaker Cards!!!!! For my red mitten shaker card, I used the mistletoe crinkle ribbon and the Candy Cane Trendy Twine for my bow. I stamped "Happy Holidays!" on my handmade tag. I added pretty white pearls and for the shaker portion I used the festive Candy Cane Sequins Mix! 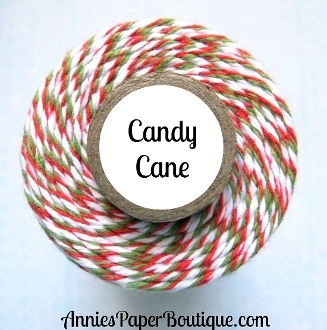 For my green mitten card, I made a gorgeous bow with the holly berry crinkle ribbon and the Candy Cane Trendy Twine. 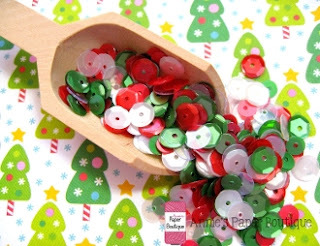 I just love how pretty the Candy Cane Sequins Mix look! Here is a closer look at the very festive Candy Cane Sequins Mix! 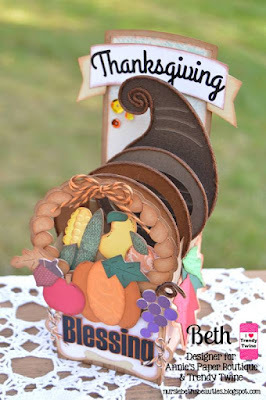 The Trendy Twine Team would like to wish you a very Happy Thanksgiving! Some of the design team made some Thanksgiving cards to share our gratitude. Please stop by their blogs to see more about their projects. Have a wonderful holiday! 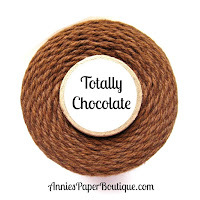 Today I am highlighting the pretty Thanksgiving Orange Truffle Trendy Twine along with some additional twines. 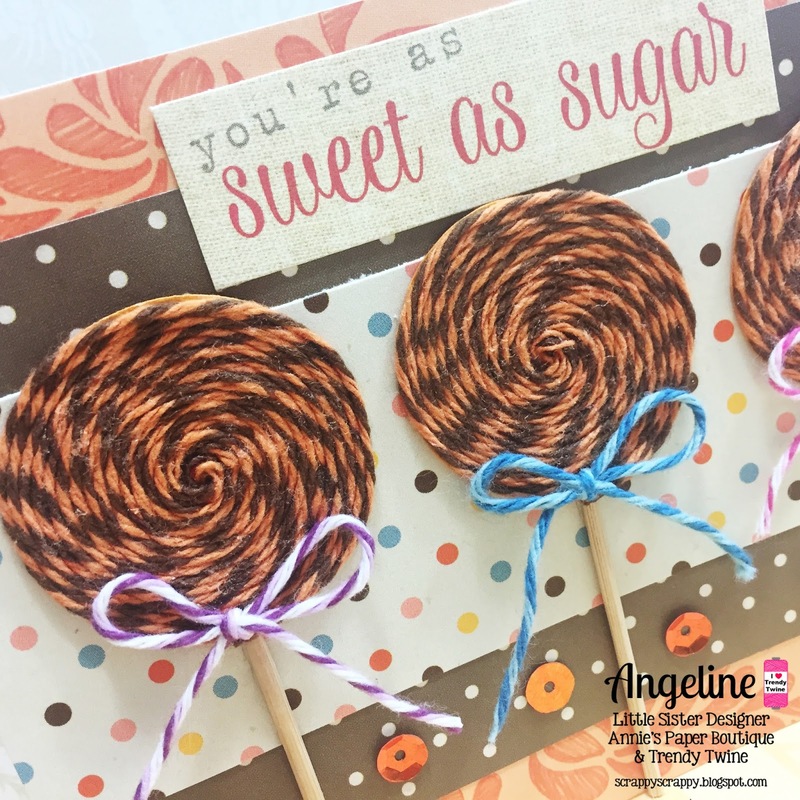 So, how did I make the lollipops? Can you believe that it is almost Thanksgiving?? I thought I would make a project that can work for the dinner table. These 2X2 Kraft Boxes can be filled with candy and be a fun treat for your guests to take home with them. To make my project, I started with a 2X2 Kraft Box and covered it with some beautiful designer paper from Recollections~Harvest Collections paper pack. Next using one of the panels (before it was attached to the box) I die cut a leaf using My Creative Time's A Thankful Heart set. 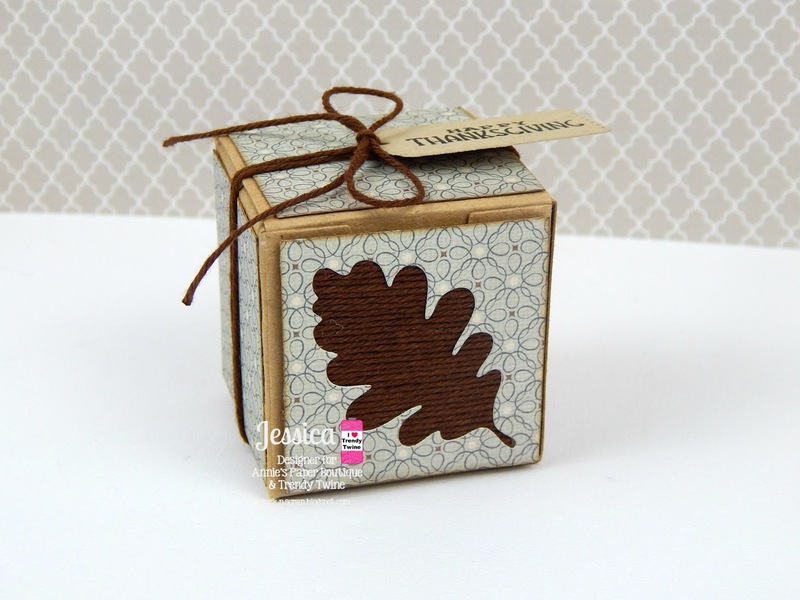 I filled the leaf with the Totally Chocolate Trendy Twine then attached it to the box front. I wanted to add a simple tag as well to by box, so I grabbed a Fun Stitched Tag Die , stamped my sentiment from the Fall Friends set and attached it all to the top of my box with more Totally Chocolate Trendy Twine. Thanks for stopping in today! I hope you all have a GREAT Tuesday! Hello everyone! I'm Helen from HTB Creations. 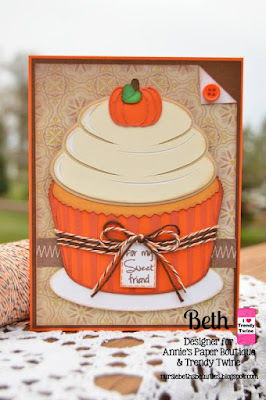 Today I made a shaker card using the new Creamy Pumpkin Trendy Twine. All four new colors are so fun! 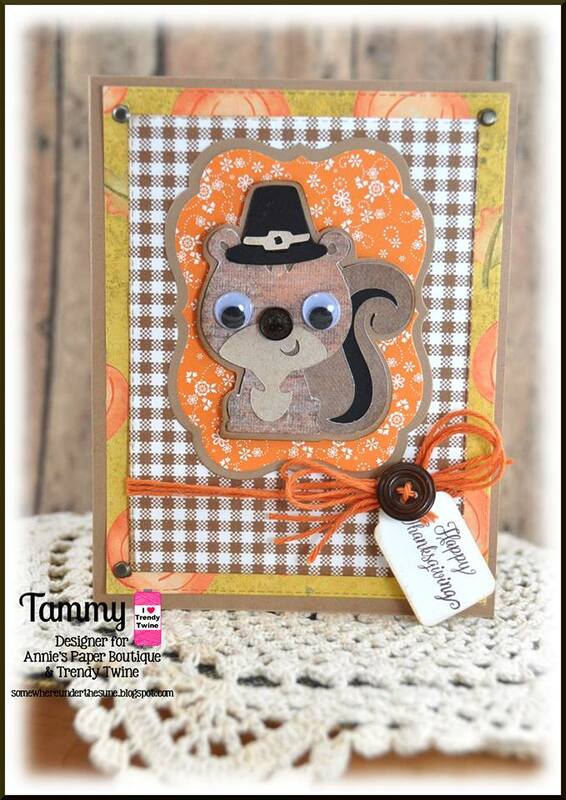 I also used the new Autumn Sequins Mix. I finished it off with a leaf that I stamped and die cut. 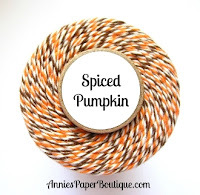 And then a double bow of my Creamy Pumpkin Trendy Twine. Be sure to visit Annie's Paper Boutique for the new Twine and make sure to check out all the other fun goodies you can pick up too. 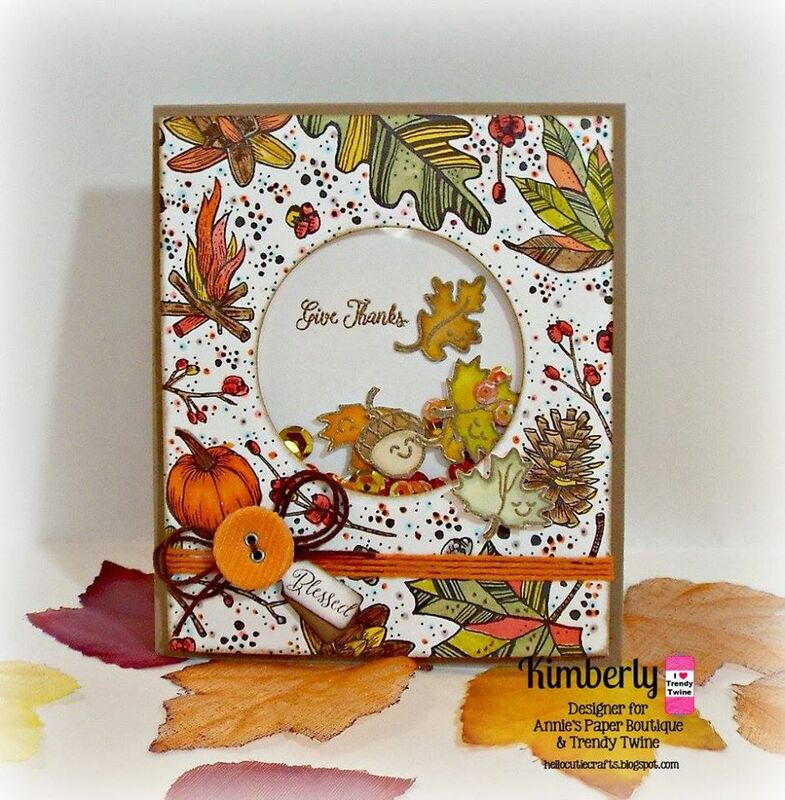 It's Millie, from Crafting with Creative M, sharing a Thanksgiving gift box featuring the Spiced Pumpkin Trendy Twine, 2x2 Kraft Box, along with the Hello Fall Planner Stamp Set. I am going to be make several of these gift boxes and filling them with Hershey's Kisses....Yum! 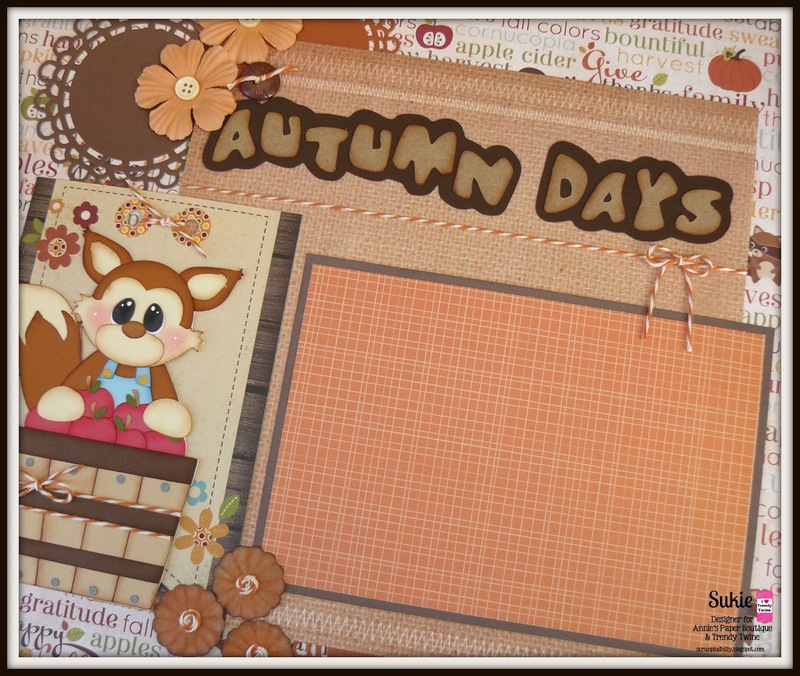 I used The Autumn Melody by DCWV to cover my 2x2 Kraft Box. 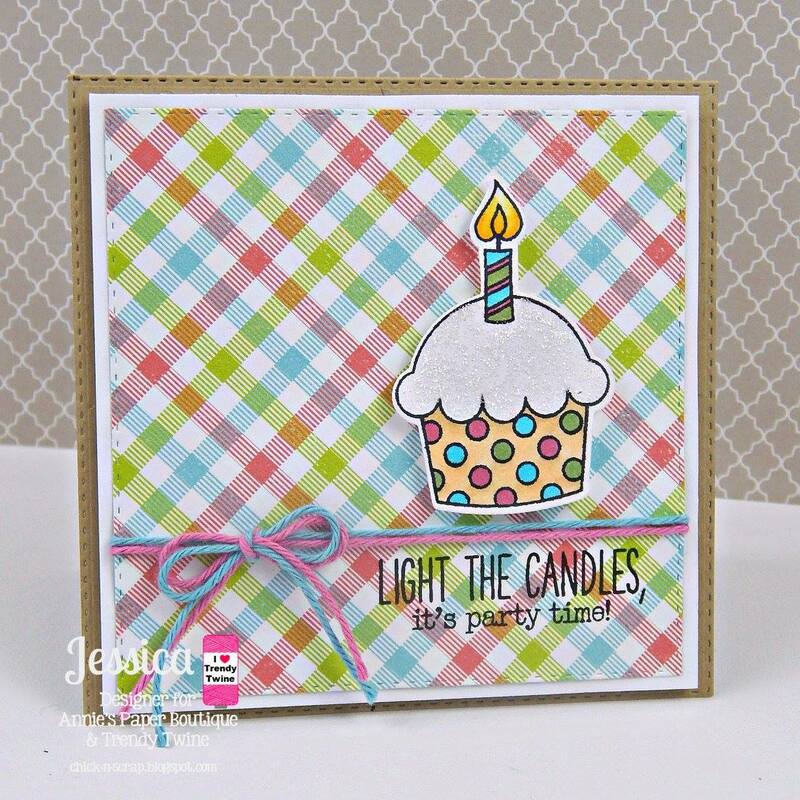 I used the Fancy Frame Stamp & Die Set from My Creative Time. 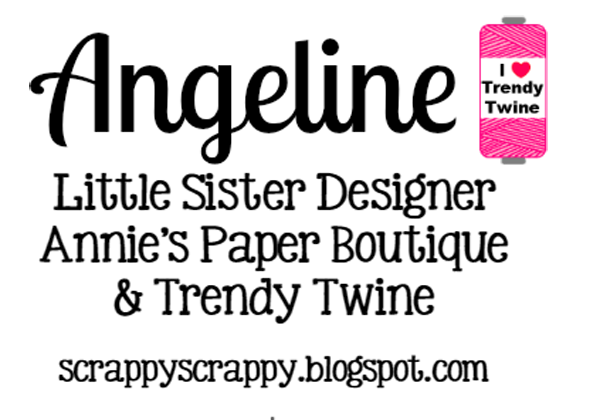 I found the "Be Thankful" caption on the Cricut Explore DS, which I adhered it to the center of the frame and then placed it on my gift box. I made little pom poms with the Spiced Pumpkin which I placed to each corner and wrapped some of the Spiced Pumpkin Trendy Twine around the bottom of the kraft box. To complete my gift box I added tiny white pearls. 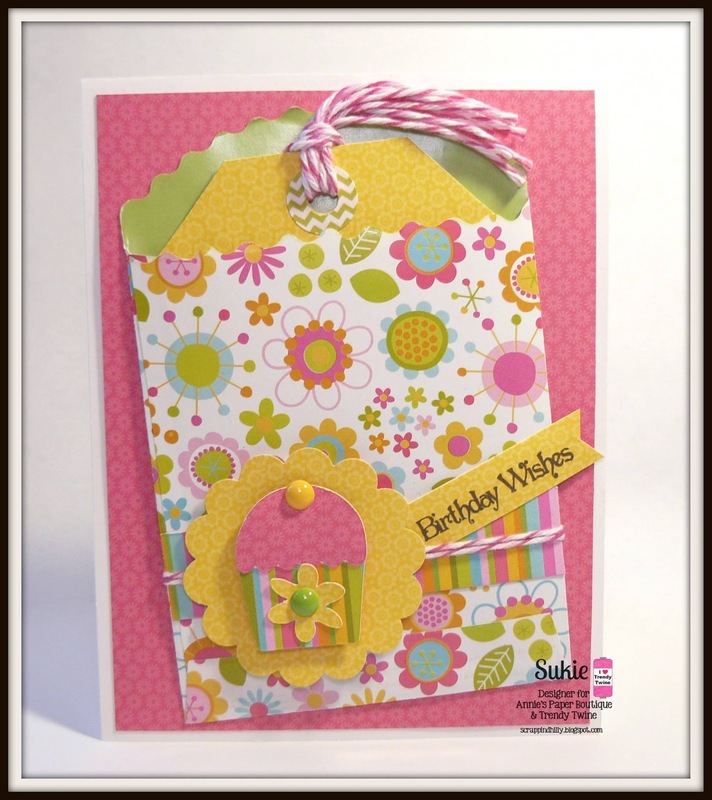 For the top portion of the gift box I made a super cute topper with the Scallop & Stitched Circle Die from My Creative Time. I then stamped and fuzzy cut the adorable image and "Thankful" sentiment from the Hello Fall Planner stamp set and placed tiny white pearls on each corner. The DT ladies have all created something special for her and we wanted to share them with you as well. 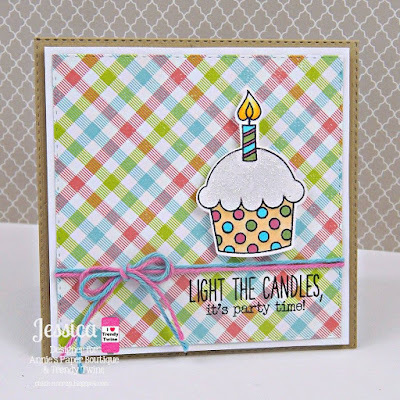 Click on their names above their cards to see all the details on their blogs. 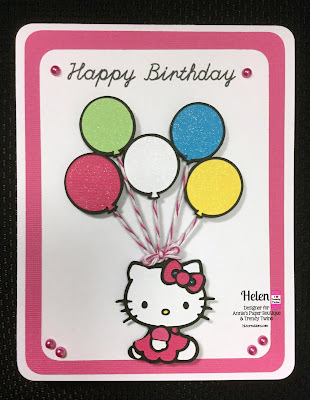 I hope you have enjoyed seeing all of the birthday cards we have shared with you today. Hello everyone, this is Sukie with a fun project featuring the newly released Creamy Pumpkin twine. 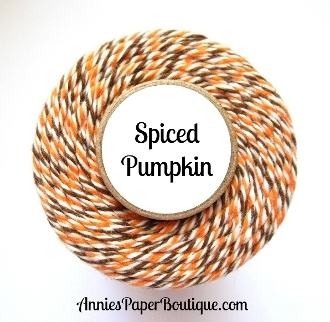 It is a gorgeous twist of pumpkin orange and natural/unbleached twine. For my project, I created a fall themed layout page using the Crisp Autumn Days cutting file from KaDoodle Bug Designs. 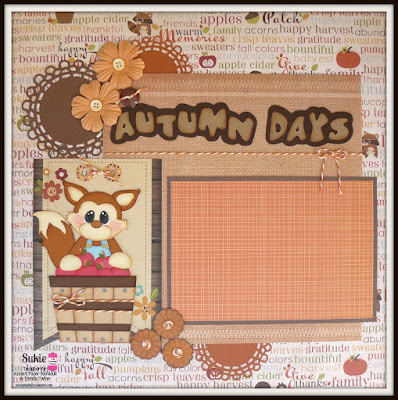 I added the fox and his barrel of apples to a large banner tag so he would stand out on my project. 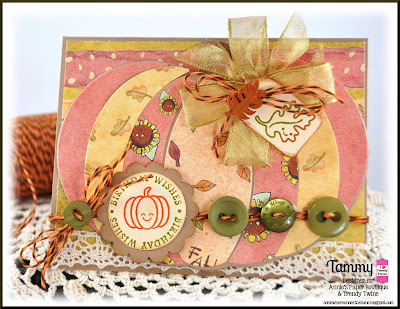 The banner tag was accented with a couple of coordinating Hello Fall Trendy Page Dots and some twine. 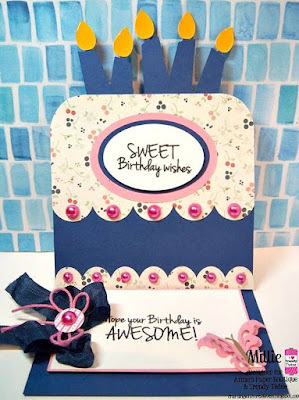 A few scalloped flowers were punched using kraft card stock and the twine was used for the centers. I used my watercolor pencils to create the accents on the scalloped flowers. I also embellished the background mat with a bit more twine. A couple of doilies from my stash were tucked in behind the mat and accented with some coordinating flowers. Head on over to Annie's Paper Boutique to check out all of the new gorgeous twine colors available for those Fall projects. 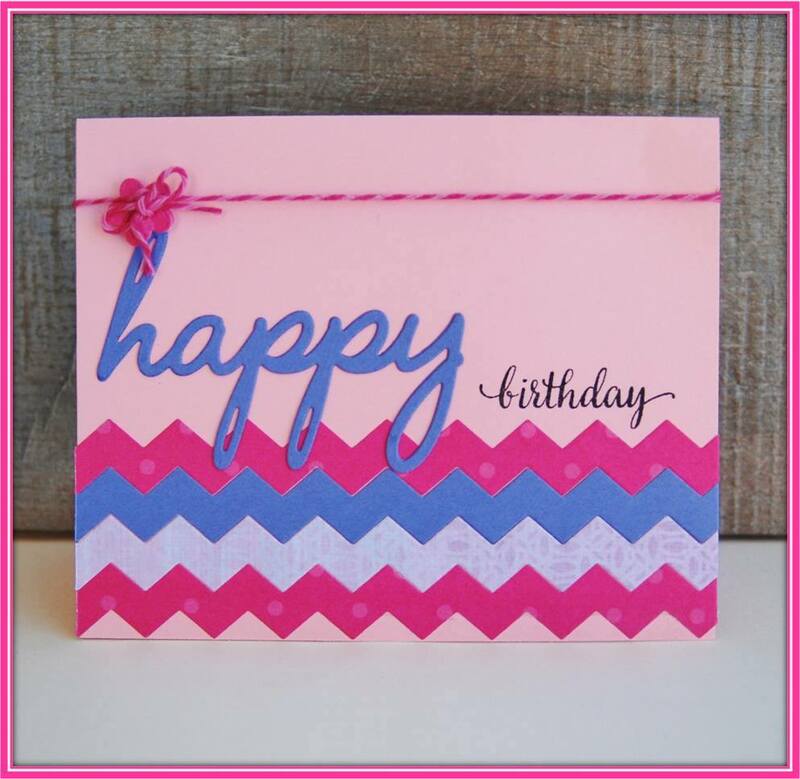 Thanks so much for stopping by and have a fabulous day! Trendy Twine - Give Thanks!